It’s just horrible when your favorite teapot breaks, but don’t despair! There’s no need to throw your broken teapot out. Instead, try these 5 clever ways to give your broken teapot new life. “All this said the teapot in its fresh young life. It stood on the table that was spread for tea; it was lifted by a very delicate hand, but the delicate hand was awkward. The teapot fell, the spout snapped off, and the handle snapped off. The lid was no worse to speak of; the worst had been spoken of that. “I never shall forget that experience,” said the teapot, when it afterward talked of its life. “I was called an invalid, and placed in a corner, and the next day was given to a woman who begged for victuals. I fell into poverty, and stood dumb both outside and in. But then, just as I was, began my better life. One can be one thing and still become quite another. “Earth was placed in me. For a teapot, this is the same as being buried, but in the earth was placed a flower bulb. Who placed it there, who gave it, I know not; but given it was, and it became a compensation for the Chinese leaves and the boiling water, a compensation for the broken handle and spout. Broken spouts or handles shouldn’t keep you from using that broken teapot to plant a pretty bunch of petunias, vining ivy, or spring bulbs. Place a few rocks or marbles in the bottom of the teapot to aid in drainage. Pour in potting soil. Plant your selected plant or bulbs, adding soil as needed. Water and watch the transformation of your teapot. As there will be no drainage hole at the bottom of the pot, test the soil for moisture before adding more water. If the pot itself is cracked, it can still be used as a flowerpot. Just remember to place a plate or flowerpot saucer under it to catch any water that may drain from it. Once planted, the teapot flowerpot can be placed indoors or outside. If placed outside, place the flowerpot in an area where the soil will not be constantly saturated with water. For a rustic or shabby chic look at teatime or anytime, use your broken teapot as a flower vase. It’s best to use pots where the body of the teapot is free of cracks. Teapots with a broken spout or handle work well as a flower vase. Large flower arrangements with flowers or leaves draping over the broken spout or handle can hide any breaks so your guests will never know you’re using a broken teapot as a flower vase. If you don’t care what they might think, then don’t worry about hiding any broken bits. Tall flower arrangements or a single branch or flower show off, with great joy and happiness, the new life you’ve given to your teapot. Place rocks, marbles, or a floral pin frog in the bottom of the teapot. Add water at least 1 inch (2.5 centimeters) below any openings, such as where a handle or spout broke off. Add the flower, branches, grasses, and so on. This idea would be wonderful for an outdoor picnic table. Sometimes, it’s just the lid that breaks on a teapot. Other times, the tip of the spout breaks. If one or both of these things has happened to your teapot, change it’s purpose to a watering can. It sounds simple enough – add water to the broken teapot and use it to water flowers or plants in your flowerpots. Kick that watering up a notch by watering with a tea solution poured from your flowers’ very own teapot watering can. Add used teabags or tea leaves (black, green, or herbal) to your broken teapot. Heat water and pour onto the used tea. Steep for 1-2 hours. If you’re in a hurry and can’t wait that long, just make sure the water is cool before using it to water your flowers. Whenever you need to water your flowers, use the weak tea solution. If a few tea leaves get on the soil, that’s okay as they will provide nutrients to the plant. Use the tea solution within a few days to prevent mold growth, which may harm your plants. Avoid using teas with added flavorings, such as Earl Grey, as the oils may kill beneficial soil bacteria or cause soil fungal growth to occur. If you love funnel cakes, here’s an idea for pouring the batter into the oil that will leave your fingers and your countertops cleaner – use your teapot. The same with cupcakes! If you love making cupcakes but batter ends up all over the pan when you’re trying to get it into those little paper cups – use your teapot. A teapot with a missing or broken lid can have a great new life pouring batter for your favorite desserts. Mix your favorite funnel cake or cupcake batter in a mixing bowl. Pour the batter into a clean teapot. Tip the teapot and pour the batter in a spiral for a funnel cake or directly into paper holders for the cupcakes. Fry or bake as directed. Wash your teapot in hot soapy water to remove the batter. To clean the spout, use a small bristle brush. When your teapot has cracks or chips that won’t cause the teapot to break easily into pieces, but the cracks keep you from using the teapot as a vase or watering can, upcycle the teapot into a utensil holder. In your kitchen, let’s upcycle your broken teapot as a holder for wooden spoons or wooden handled spatulas. Wooden handles on utensils are typically smaller than metal or plastic handles, which makes it easier to fit several wooden-handled utensils into the top of a teapot. In your kitchen or at your table, let’s upcycle your broken teapot as a chopstick holder. Chopsticks made from a variety of materials, such as wood, plastic, bamboo, metal, or jade, work equally well in the teapot. Place clean or new chopsticks into the teapot. Store the holder on your kitchen counter or table for easy use and as a decorative container. 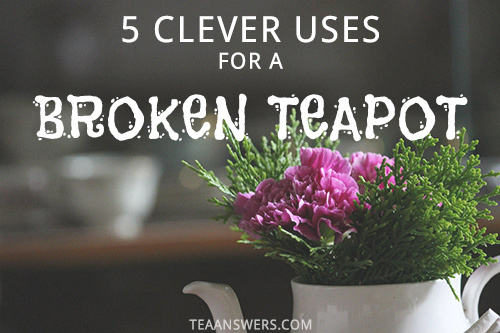 How do you plan to use your broken teapot? Do you have other ideas for upcycling teapots? I’d love to hear your ideas in the comments below.